some cars special for Africa. Version 3.4 – added Audi A8(D4), new car trailer, Peugeot 308 French Police, Alfa Romeo 159 Italian Police, Ford Mondeo Finnish Police, Volvo XC70 Swedish Police, Opel Astra Estonian Police. Well done , thank you Jazzy !!! 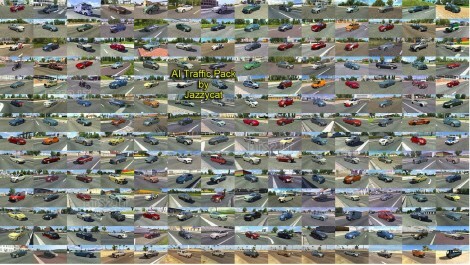 I’m the mapper of the Rotterdam Map 1:1 scale and I was wondering if it was a problem to select cars from your AI pack to be used on my map? I would like to use it as a add-on. Of course you will get the credits when I release my map. Великолепная работа ! Спасибо Денис. Jazzy, Вы снова на вершине! Hi everyone, I need help due to I have constant crashing. here are my activated mods. Somebody please tell me why game keeps on crashing especially when am driving and it tries to auto save. please…add to car OPEL ASTRA G CARAVAN…PLEASE…PLEASE…. 00:23:18.860 : [model] Unknown variant named ‘default’ in model ‘/vehicle/ai/jazzycat/mb_gl/mb_gl.pmc’. 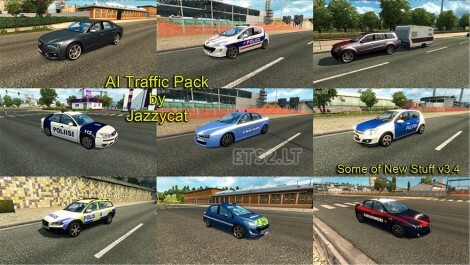 Is there any diferences between this and this one https://ets2.lt/en/ai-traffic-mod-for-ets-2-v1-22/ ? Please… Would You Change Sportage Model in next version? ‘THE NEW SPORTAGE’ Has been released lately. ???? Thank you on that great work , Jazzycat !! How to activate this mode? I put it in mod folder, but it isn t in game mods folder. I put this mod in to mod folder, but I cant found it in mods folder in game. How to activate this mod? Jazzy, one of your cargos are with a bug at euro tunnel. “pipes” dont enters at wagons… see? Hello Jazzy! I drove in Hungary and I found this Fire Chief Skoda Octavia! Is it a part of your traffic pack or not? I’m not using any other pack than that one from you! 00:00:36.806 : Loading sound item data …. 00:00:36.807 : Loading live stream data …. 00:00:36.809 : Loading game condition data …. 00:00:36.810 : Loading trigger action data …. 00:00:36.816 : Loading cutscene data …. 00:00:36.840 : Loading cargo data …. 00:00:36.892 : Loading company data …. 00:00:38.031 : Loading unlock data …. 00:00:38.066 : Map ‘/map/europe.mbd’ loading started …. 00:00:39.108 : Map successfully loaded. 00:00:39.227 : Road network navigation caching started. 00:00:44.895 : Road network navigation caching finished. 00:00:44.916 : Garage update started. 00:00:45.123 : Garage update finished. 00:00:50.689 : Ignoring obsolete attribute ‘looks’ of unit ‘chassis.opalin2’ (of type ‘accessory_chassis_data’). 00:00:50.782 : Ignoring obsolete attribute ‘front_wheel’ of unit ‘fwheel.toyota_prius.jazzy’ (of type ‘accessory_wheel_data’). 00:00:50.782 : Ignoring obsolete attribute ‘front_wheel’ of unit ‘rwheel.toyota_prius.jazzy’ (of type ‘accessory_wheel_data’). 00:00:50.856 : Ignoring obsolete attribute ‘front_wheel’ of unit ‘fwheel.citroen_c1.jazzy’ (of type ‘accessory_wheel_data’). 00:00:50.856 : Ignoring obsolete attribute ‘front_wheel’ of unit ‘rwheel.citroen_c1.jazzy’ (of type ‘accessory_wheel_data’). 00:00:50.865 : Ignoring obsolete attribute ‘front_wheel’ of unit ‘fwheel.mb_gl.jazzy’ (of type ‘accessory_wheel_data’). 00:00:50.865 : Ignoring obsolete attribute ‘front_wheel’ of unit ‘rwheel.mb_gl.jazzy’ (of type ‘accessory_wheel_data’). 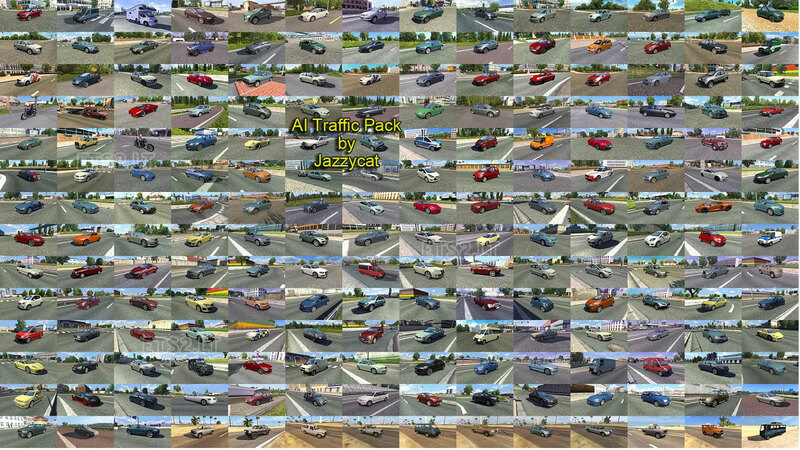 00:00:50.881 : Ignoring obsolete attribute ‘front_wheel’ of unit ‘rwheel.small_tr_cam.jazzy’ (of type ‘accessory_wheel_data’). 00:00:50.960 : Ignoring obsolete attribute ‘front_wheel’ of unit ‘fwheel.punto.ai’ (of type ‘accessory_wheel_data’). 00:00:50.960 : Ignoring obsolete attribute ‘front_wheel’ of unit ‘rwheel.punto.ai’ (of type ‘accessory_wheel_data’). 00:00:50.989 : Ignoring obsolete attribute ‘front_wheel’ of unit ‘fwheel.accord.ai’ (of type ‘accessory_wheel_data’). 00:00:50.989 : Ignoring obsolete attribute ‘front_wheel’ of unit ‘rwheel.accord.ai’ (of type ‘accessory_wheel_data’). 00:00:50.999 : Ignoring obsolete attribute ‘front_wheel’ of unit ‘fwheel.vw_pas_b5’ (of type ‘accessory_wheel_data’). 00:00:50.999 : Ignoring obsolete attribute ‘front_wheel’ of unit ‘rwheel.vw_pas_b5’ (of type ‘accessory_wheel_data’). 00:00:51.007 : Ignoring obsolete attribute ‘front_wheel’ of unit ‘fwheel.ford_focus_1.jazzy’ (of type ‘accessory_wheel_data’). 00:00:51.007 : Ignoring obsolete attribute ‘front_wheel’ of unit ‘rwheel.ford_focus_1.jazzy’ (of type ‘accessory_wheel_data’). 00:00:51.040 : Ignoring obsolete attribute ‘looks’ of unit ‘chassis.opalin’ (of type ‘accessory_chassis_data’). 00:00:51.040 : Ignoring obsolete attribute ‘front_wheel’ of unit ‘fwheel.a3.ai’ (of type ‘accessory_wheel_data’). 00:00:51.040 : Ignoring obsolete attribute ‘front_wheel’ of unit ‘rwheel.a3.ai’ (of type ‘accessory_wheel_data’). 00:00:51.055 : Front wheel model instance 0 is missing for chassis ‘chassis.toyota_prius’ (with model ‘/vehicle/ai/jazzycat/toyota_prius/toyota_prius.pmd’), expect crash. 00:00:51.055 : Front wheel model instance 1 is missing for chassis ‘chassis.toyota_prius’ (with model ‘/vehicle/ai/jazzycat/toyota_prius/toyota_prius.pmd’), expect crash.